Liverpool manager Brendan Rodgers says moves have been made to tie some of the club's youngsters to new deals. Teenagers Raheem Sterling, Suso and Andre Wisdom have broken into the first team this season, while other young players have also impressed. "It's [new contracts] something we'll look at between now and the next few months," said Rodgers. "There have been discussions with the club and with representatives, but it's at an early stage." Rodgers has given Liverpool's promising youngsters a chance in the first team and, after six Premier League games, he has fielded the youngest line-up with an average age of 23.38. Winger Sterling, 17, has been particularly impressive and has played in eight of the club's 12 outings this season. He was called up as a late inclusion to the England senior squad for the World Cup qualifier against Ukraine in September but did not play. On Wednesday he received a call-up to the England Under-21 squad for the double header against Serbia. Playmaker Suso, 18, and 19-year-old right-back Wisdom have also made their first-team debuts for Liverpool this season and each started in the 5-2 win at Norwich last Saturday. "Young players just need time to develop. In this country in particular, we see a talent and always think we have to push him up and keep pushing him up," said Rodgers. "We want to ensure the talents are not just talents at 17, but also at 27 and, if they're managed correctly, then maybe they can go on to 37." 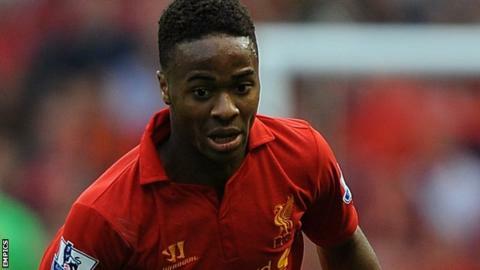 He added: "Raheem is a level-headed kid and has good support around him. He's taking everything in his stride at the moment. "He's still got a lot to do and a lot to learn, but thankfully he's got good focus and concentration."